The MT-70 and MT-71 series of stands are sturdy, stable, and extremely versatile for mounting components for a variety of research applications. They were designed for placing our heavy Huxley-style micromanipulators adjacent to any microscope. We found them to be so useful and adaptable that we also use them for mounting other items such as optical components. The stands are based on a rigid extruded aluminum tower which is available in 3 inch increments up to 12 inches. The tower is mounted on a sturdy 3/4in thick aluminum baseplate and then fitted with a 5/16in thick aluminum mounting platform. These systems are configurable as fixed height stands or, in the MT-71 series, have an adjustable height cantilevered side platform for added versatility. The tower can be center or edge mounted to the baseplate for accommodating various spatial layouts. Rows of 1 inch and 25mm centered clearance holes are provided in the baseplate for attachment to tables. The mounting platforms have tapped 1/4-20 mounting holes on 1 inch centers. 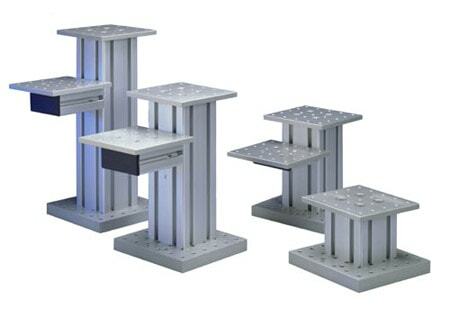 The stands are available in sets or you can order individual components separately to meet your specific requirements. Custom heights can be made to order for an additional fee. To securely fasten our MP-85 Huxley style manipulator to the mounting plates, please order the manipulator adapter plate at the time of purchase. Larger baseplates or mounting plates are available upon special order.